” Lets hear it for New York! Concrete jungles are where dreams are made of, there’s nothing you can’t do!”, my sister and I sang as we landed in the New Jersey airport. Our final destination thas week was New York. The reason; My mom, Susie, is running the New York City Marathon. This was her third attempt since the fist time, she pulled her achilles tendon, the second time the marathon was canceled due to Hurricane Sandy. But as we all know, the third time’s the charm. Very well, so Halloween came and past while we were here, and we ended up going to the Village Halloween Parade. Boy was that a mistake. There were so many people that for over an hour we were bumping up against people non-stop. After we were done with the only okay parade, we found the nearest subway station, Only to find that there were so many people coming out of the subway station that the police lady wouldn’t even let us go in. Eventually, we found another subway station and took it back to our place. 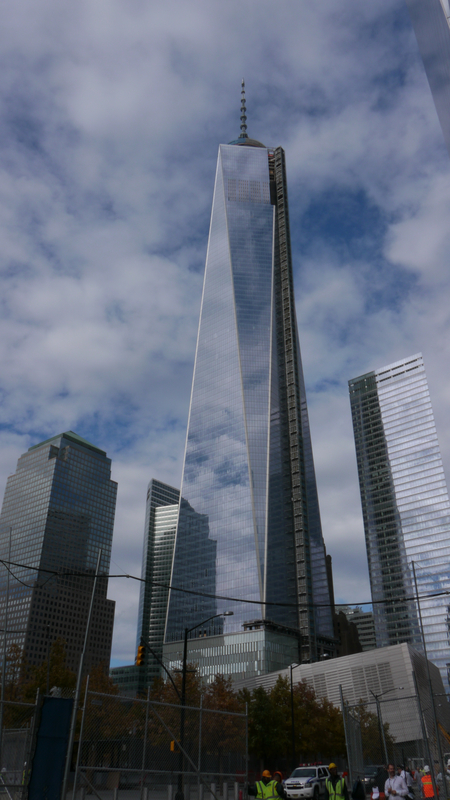 This is the Freedom Tower. It’s meant to be a replacement for the world trade center. We toured the city until sunday, (that’s when the New York City marathon is) where my mom left the house at 6:45 am to go to the starting line. We all gave her our luck and she was off to run her 26.2 miles! Dad, Edie, my grandparents, (who came to see Susie) and I ended up seeing her in two locations which is quite lucky considering that there are 45,000+ runners in this race. Susie finished the race in three hours and fifty minutes, which is absolutely fantastic! This entry was posted in New York and tagged New York, New York City marathon, Village Halloween Parade.